Look at that cover, and tell me who doesn't belong. A bunch of guys in outlandish, colorful costumes, and one guy in a drab gray prison uniform. 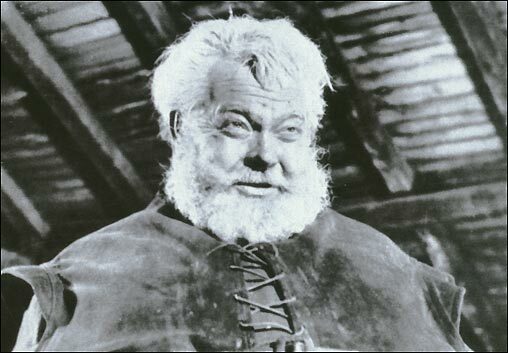 No, he doesn't look like a super-villain. And that's the point. This design of Luthor was the antithesis of Superman. Supes wore a brightly colored, distinctive outfit. (Well, distinctive until his cousin and a bunch of animals started copying him, anyway.) Lex stuck with a dull suit which marked him as just one man in a crowd (on those rare occasions where he actually stayed in prison). Superman had his full head of black (or dark blue) hair; Luthor was bald. Superman had his muscular physique; Luthor had a bit of a paunch, and (depending on the artist) could actually look a bit portly. Superman stood out, rose above the crowd. Luthor looked like some guy. 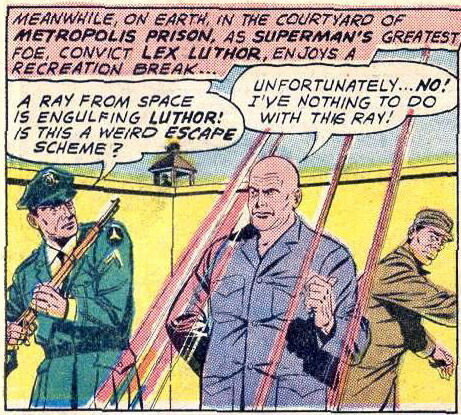 Superman was flashy; Luthor couldn't care less how he looked. And Superman had a plethora of fantastic powers, while Luthor relied on his intellect, using his inventions to do his super-deeds. When DC gave Luthor a costume, I think they completely missed the point of their own character. They wanted Luthor to be able to go toe to toe with Superman, and so they tried to turn him into just another super-villain. Sure, super vs super can be fun. And I like the green-and-purple combo as much as the next guy. 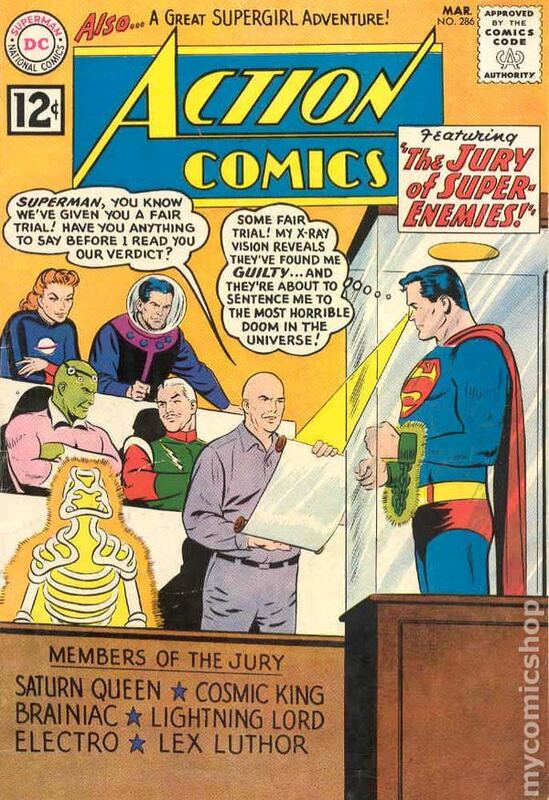 But the old Luthor was the polar opposite of Superman, and the visual reflected that. 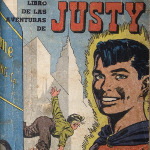 He was a purer contrast to Superman, and that made for a more satisfying conflict. 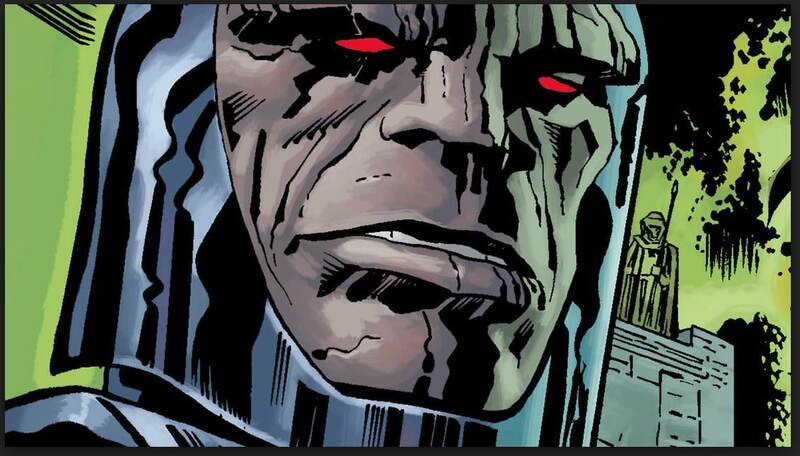 Here's the genius of Kirby's design for Darkseid: he's not designed for action. He's designed to look imposing as hell just standing there, like the statue his granite-like face suggests. An immovable force, a massive block of a being, not something that will hit you with a stone fist, but whose stare alone will paralyze you with intimidation. Another ingenious visual innovation by Kirby, these obliterating parallel beams that dart, curve, pursue relentlessly...while Darkseid stands, patient, brooding, looming, and eternal. What can I say about Doctor Doom? 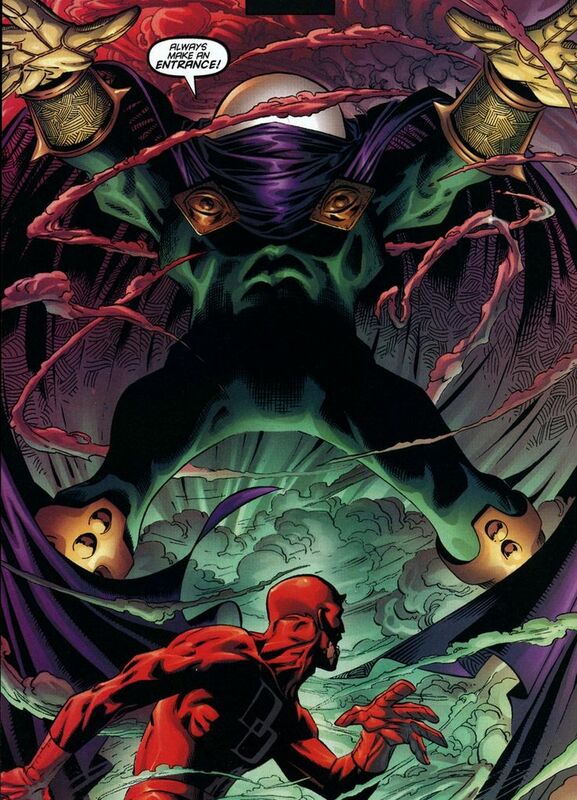 He's just an all time great comic book villain (and, incidentally, since he appeared in Amazing Spider-Man #5, way back in 1963, I tend to think of Doom as being as much a Spidey villain as a Fantastic Four one). My computer ate my homework, and I don't have time now to rewrite everything, so I'll explain this in full when we do our also-rans breakdown later. What can I say about Doom that hasn't already been said? The character design is enigmatic and menacing like some sort of evil knight and wizard combined. One of the things that I think makes him truly terrifying is that he is a fascist dictator that in some ways has actually brought prosperity to Latveria (depending on the writer). That alone should be scary to anyone living in the free world. Again an armor look invented by its wearer that speaks to the genius of the character. Doom to me epitomizes the villain being the hero of their own story. He just wants to rule the world under his iron fist because he thinks he knows what's best for it. 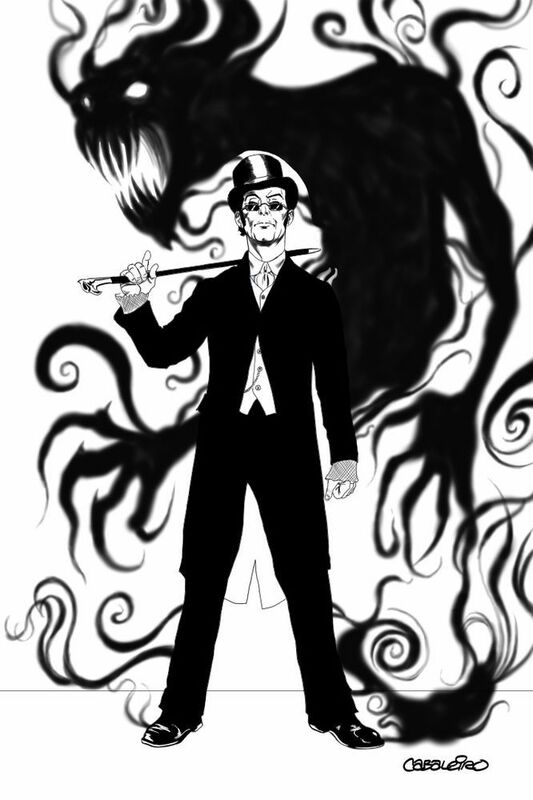 Here’s a villain designed to be the most non-descript, but frightening of all villains, because he was someone you knew. He might have been your classmate, your neighborhood pal, a guy you worked with, the one who sold you your car or fixed your furnace, or went out with your sister. Or he could have been the guy you saw in the mirror every morning. He was Private Johnny Doe, and he looked like every other GI in Rock’s fabled Easy Company. His helmet cocked to one side, a cigarette dangling from the corner of his mouth, a bit of stubble darkening his chin, and a uniform that showed the wear and tear of long months in combat. 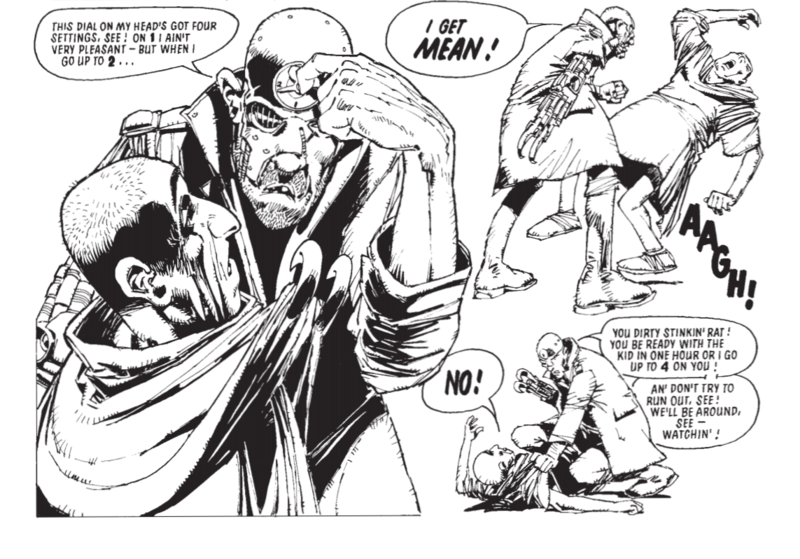 Thank Joe Kubert for that. As he proved for decades, he could draw men at war. But this one was slightly different. Doe’s face was a portrait of indifference, all hooded eyes and a know-it-all smirk. That look and Johnny Doe’s unflappable coolness under fire from the enemy and from Rock himself only added to Doe’s mystique. Because Johnny had a knack for finding and killing the enemy. Always seemed to be in the right place at the right time. Always pulling Easy’s bacon out of the fire. Doe, like any villain, followed his own rules, but he was crafty. He could always hide behind the official rulebook when he had to. After all, the more Germans he killed, the quicker the war would be over, right? Like any formidable villain, Johnny Doe was galvanic; Easy was taking to Doe “like a starvin’ kitten to sweet cream,” as Rock put it. When the civilians Johnny shot proved to be German soldiers in disguise, when the prisoners he shot were found with guns, when he sneaked out at night on his own to kill Germans, Doe impressed the men of Easy with his native instinct for dispensing death. Only Rock knew that every night Johnny Doe carved notches on the stock of his gun, one for each of his kills. Nobody who read this story in 1971 was expecting to see the confusing villainy of Pvt. Johnny Doe. There's a reason the cover of OAAW 233 was on the cover of the New York Times Sunday Magazine on May 2, 1971. Thank Kanigher for all that. Every so often he could carve a damn good story out of familiar materials when you were least expecting it. And when they reached the French village of Alimy, it all became even more eerily familiar. ("Alimy" is an anagram.) How Johnny’s story ends, I’ll leave for you to find out. The scariest of comic book villains pale next to Johnny Doe. Nobody’s ever seen Galactus or the Joker or Dr. Octopus except in funny books or on movie screens. But everybody knows Johnny Doe. What’s worse, anybody can become Johnny Doe. And in 1971, everyone in America knew that for a fact. We've come across the character earlier, but with a different design. My favourite is the instantly-recognizable and iconic look given to the Stygian wizard by Barry Smith in Conan the barbarian #7. The ram horns (which forever made me see Thoth-Amon on the back of Dodge trucks) are typical of the Egyptian god Amun, and as a headgear for the sorcerer have become as idiosyncratic as Galactus's helmet of Dr. Doom's mask. Wow, I wouldn't have thought of him in a billion years but that's a powerful pick Hal. If this was a game with winners and losers I can safely say you wouldn't be in the latter group. 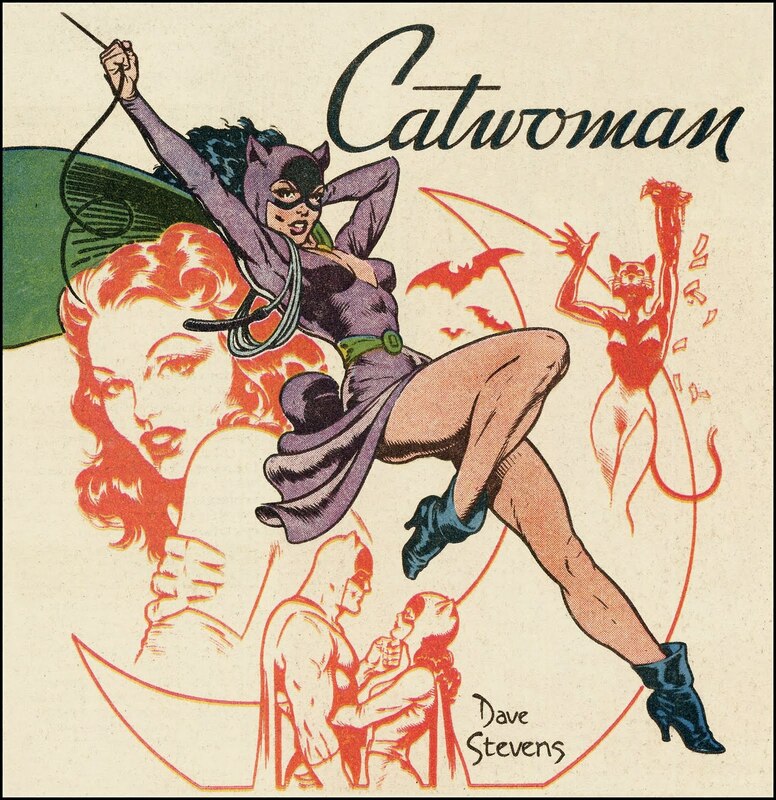 While I tended not to try to duplicate too much, Catwoman's purple and green look has always been my favorite. She takes the Dragon Lady look and spins it with a bit of supervillainy for the purrfect femme fatale. I think my first exposure to this character might have been on the late 60s Spider-Man cartoon. He was a bit different there. Obviously animations (especially then) did not allow for as much detail as illustration. I distinctly remember him having a sort of vertical frequency line on his helmet that vibrated when he spoke. I love the mystery of the faceless foe. Steve Ditko's design was very creepy to me. In addition to the featureless dome, those eyes on the chest... quite bizarre! And fascinating to me. Was he even human? It's always the stuff we encounter when we're young that makes the deepest impression, so I don't think anyone else will ever surpass Mysterio for me. Since we're going by design only i have to go with the awesome orange /green combo. 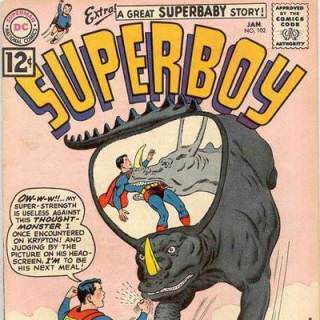 I don't talk enough about the Kryptonian Thought Beast. So, for the record - I frickin' looooooove the Kryptonian Thought Beast. So the designs on this list have generally slotted into one of two categories (A) Goofy comedy, and (B) pants-wetting terror. The Kryptonian Thought Beast is both. He's a big frilled triceratops type thing with a frill that projects what he/she is thinking. That's hilarious! But the KTB is usually thinking about tearing you apart. Not only is there a 97% chance of death, you can see exactly what's going to happen in all the gory details. This is EVERYTHING (plus dinosaurs!) that I want in a villain. And my solid # 1. Last Edit: Dec 24, 2017 20:39:05 GMT -5 by Reptisaurus! The Krypronian Thought Beast is both. I think you won day 12 with this pick. 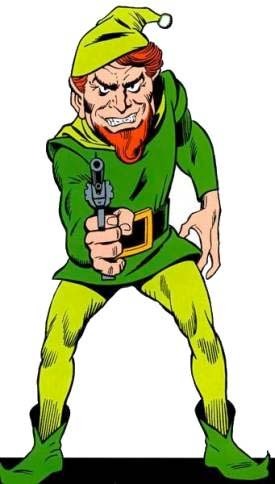 He's an elf, with a gun! 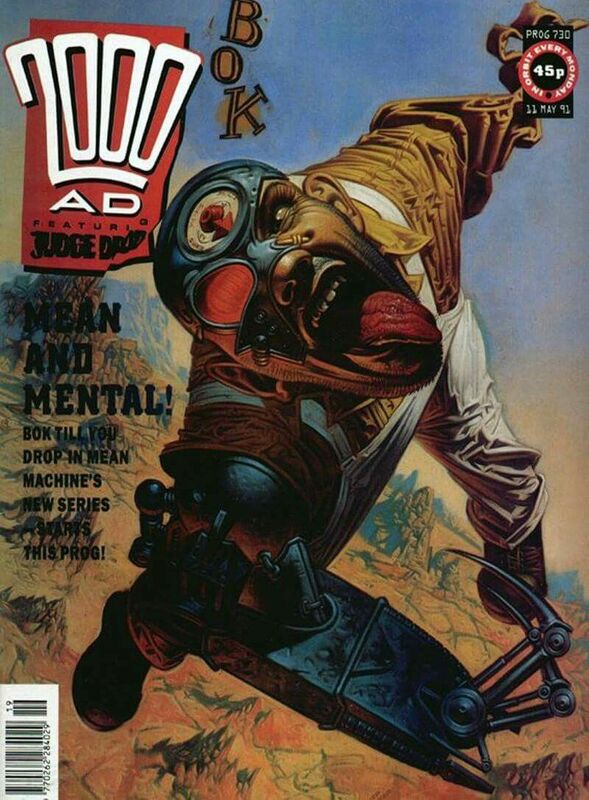 Introduced with his family during 2000AD's Judge Child Saga, Mean Machine was one of those characters that you latch onto for no apparent reason. 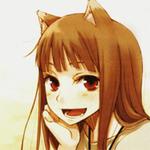 While the entire family is dedicated to the murderous arts, Mean was nice, intelligent, and gentle. This warnt no good for Paw, so's he grapt up a doc and had him a dial put on the darn boy. ,and 4. Brutal, getting his BOK on with some poor fool. If you real unlucky he get stuck on 4 1/2 going absolutely berserk. Aint nothin else out there like Mean, cyber arm and dial at the ready, a real surly sumbitch, an' he so much prettier 'n his brudda Fink(but he's another story). It was the year of fire… the year of destruction… the year we took back what was ours. It was the year of rebirth… the year of great sadness… the year of pain… and the year of joy. It was a new age. It was the end of history. It was the year everything changed.